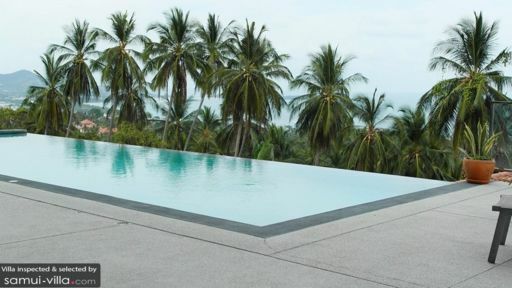 Perched atop the hills of Chaweng Noi, Villa Donna overlooks a landscape made up of tropical foliage and the ocean, and is located just a 10-minute drive away from Chaweng Beach. Living spaces outfitted with contemporary pieces are spread out across two storeys, and a spacious sun deck with infinity pool look out to the villa’s lush green surroundings. As with all luxury vacation rentals, Villa Donna offers a full range of modern amenities, ultimate privacy and impeccable service. Three bedrooms are spread out across two storeys; the master bedroom is located on the ground floor, while both guest bedrooms are set on the upper storey. Double beds, quality linen, accent chairs and private en suites (complete with toilet and shower recess) add on to the comfort factor of the rooms. Relax in air conditioned comfort within, or step out to the attached balcony to take in the cool breezes and panoramic sea view. Soak up the tropical vibes in the sun-soaked outdoor compound at Villa Donna. An infinity pool hugs close to the edge of the property, offering uninterrupted vistas out to the swaying palms and dense forestry enveloping the villa. A four seater dining set by the poolside invites guests to enjoy al fresco meals in a breezy, laidback setting. A patio extending out of the main living area comes furnished with an L-shaped couch and coffee table, and serves as a cosy hangout for shaded siestas, curling up with a book or sipping sundowners during the evening. Monochromatic hues, contemporary furnishing and minimal decorations are features that characterise the living spaces at Villa Donna. The open plan layout creates a sense of spaciousness within, where the common spaces flow seamlessly into one another. 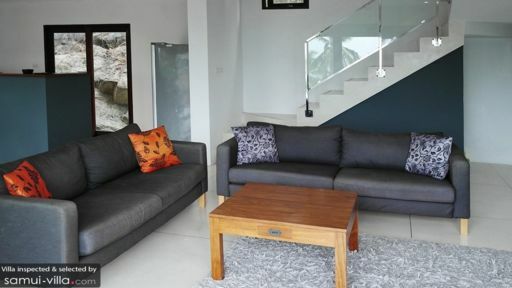 Two black sofas wrap around a wooden coffee table and flat screen TV in the indoor lounge, which extends out to include a dining area and open plan kitchen. Wi-Fi is available throughout the property so you can stay connected to friends and family back home, or catch up with urgent work projects if needed. Daily housekeeping service is included as part of your stay. Breakfast is available at request (with surcharge). Cribs or infant beds are available at no additional cost. Villa Donna is set along the eastern coasts of Samui in Chaweng Noi - one of the island’s more exclusive coasts (located a five-minute ride from your villa). The white sand shores, dotted with towering palms look out to a turquoise ocean where snorkelers go in search of coral reefs. If you’re looking to grab a bite somewhere near your villa, Marco Polo Resort & Restaurant is less than a five-minute drive away. Further along the coast is Chaweng Beach (a 10-minute drive from your villa). The vibes here are wild and lively, with restaurants, bars and nightlife venues dotted along the coast. Take a stroll over to Chaweng walking street to experience its vibrant setting and myriad street food. For a quieter ambience, take a 17-minute drive out to Bophut Beach. Located a skip away from the beach is the Fisherman’s Village, a bustling hub with a family-friendly atmosphere and a great variety of boutiques, restaurants and bars. Your villa manager will readily assist with arrangements for car rental and hiring a private driver should you wish to make a day trip. Notable attractions within the vicinity include Big Buddha (a 24-minute drive away), Na Muang Waterfall (a 34-minute drive away) and Hin Ta and Hin Ya Rocks (an 18-minute drive away).